Hendrick Motorsports is looking to sweep the field this 2016 NASCAR Sprint Cup season. Owner Rick Hendrick is nothing but grateful for his 2016 team including freshman Chase Elliot, who will be driving the legendary No. 24 car. 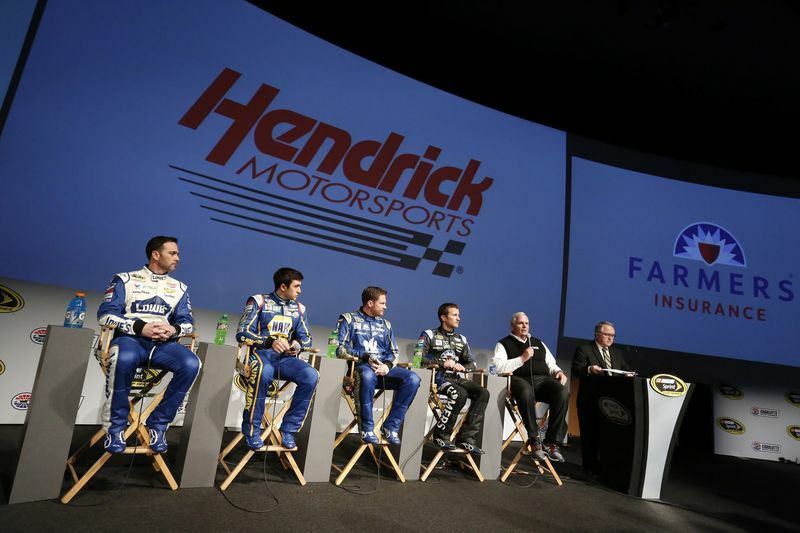 "It doesn't matter what kind of business you're in, it's the kind people," said Hendrick. "We're looking out of the windshield, not the rearview. We focus on the championships ahead, not the ones behind us." Hendrick was also nominated and inducted into the National Motorsports Press Association Hall of Fame Saturday, Jan. 16. Former NMPA President Brian Nelson, awarded Hendrick with his honorary jacket and plaque. The team also announced that Jimmie Johnson and Dale Earnhardt Jr. will face-off this season as they partner with the up-and-coming movie "Batman Vs. Superman: Dawn of Justice." Johnson (Superman) and Earnhardt Jr. (Batman) will sport their hero's emblems on the hood of their race cars for the Auto Club 400, March 20. "I have driven both the Superman and Batman car in the past and was able to claim a win in the Batman car," Earnhardt Jr. said. "I am excited to be a part of the program and it will definitely make the race more competitive between us." Elliot is confident in his abilities to fill the shoes of NASCAR legend Jeff Gordon has he takes on the No. 24 Chevrolet. Elliott believes that under the supervision of crew chief Alan Gustafson, he will excel in NASCAR's premier series. Although the pace on track reaches speeds over 190 mph, Eanrhardt Jr. advised Elliot to pace himself and enjoy life off the track as well. "No matter where we start, the good, bad, ugly or great, if we can start at that point and progress, we can come out on top," said Elliot. "We definitely have a winning race team. There are no excuses as long as I do my part to compete with really good runs." Kevin Harvick is coming off one of the most consistent seasons of his career. Danica Patrick showed signs of improvement. Kurt Busch won twice and nearly made his way into the Championship Race. But it was the fourth driver in the Stewart Haas Racing stable, Tony Stewart, that drew most of the attention during the first afternoon session of Chevy Thursday. "It feels really good to know that this will be my last media tour, I can tell you that," joked Stewart, who will be retiring as a full-time Cup driver at the end of this season. "I want to go out and have a fun year, but I also want to be racing with these three (Harvick, Patrick and Busch) toward the front every week. I want to contend for a championship." Stewart Haas will have some faces in new places for the 2016 season, as Michael Bugarewicz was promoted from race engineer to crew chief for Stewart's No. 14 Chevy, while Billy Scott moves over from Michael Waltrip Racing to serves as the crew chief for Patrick. Rodney Childers and Tony Gibson will return as the crew chiefs for Kevin Harvick and Kurt Busch, respectively. "Every change that's been made has been good so far," said Patrick, who was sporting her new Nature's Bakery powder blue and white firesuit. "I think we're going to have a lot of fun. Anytime you're racing, it's fun. But we're going to have a good year at the same time and that's what we're striving for."